It's well known that I don't have much of a sweet tooth. Chocolate does not send me into ecstasy. I don't care much for Indian sweets or desserts, especially the ghee that oozes from them. An Indian sweet that I do relish, besides a delectable paal paayasam, is the rasgulla. And not just any rasgulla. The only one that will do is the one made by Banarasi Sweets, Khar (W), right next to the Western Railway Train Station. It was the only dessert offered at the small dinner party we had for family and friends to celebrate my wedding. There may be other halwais who make a better rasgulla but the one from Banarasi Sweets was the best I have ever had. Shrikhand was never my favorite either. Till I had the adulterated version: the one with fruit in it. I became an instant convert! And that's what I made the other day. To rejoice in the fresh flavors that spring brings to the land. The 5+ feet of snow, several spring snow storms and a rainy May have turned everything a lush green. Last spring was dry and brown in comparison. We had to look for patches of green and rejoice in the small mercies sent our way. None of that this year! 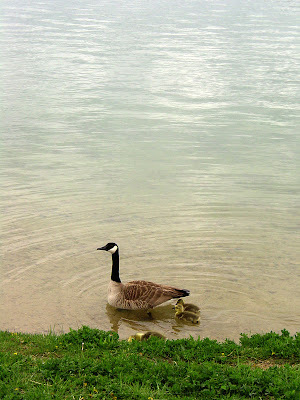 Mama goose has had four goslings she is very protective about. The finches laid eggs, their babies hatched, grew wings and flew away. If it weren't for the allergies, spring would be my favorite season! 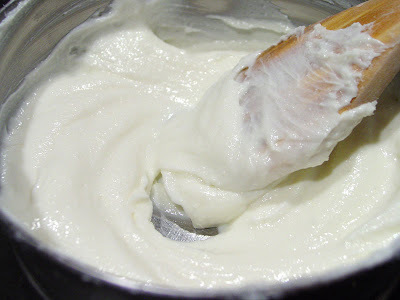 Tie the yogurt in a muslin cloth and hang for at least 6 hours to drain away the whey. 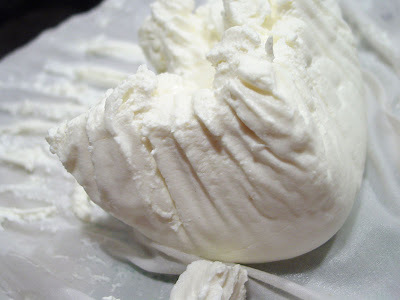 You are left with thick hung yogurt that is known as chakka. Four cups of fat-free homemade yogurt gave me 1 cup of chakka. 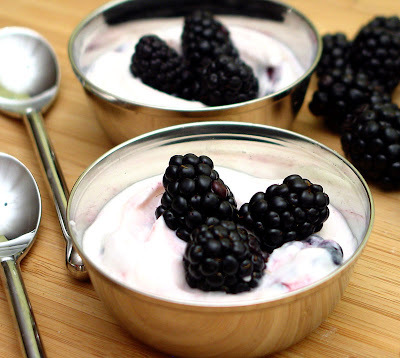 Combine the hung yogurt with sugar in a bowl and beat it until it is light, fluffy and smooth. You can use the hand-blender with the whisk attachment to do this or you could convert this into yet another opportunity to introspect, relax and rejuvenate - yes! Do it by hand. That's what I did! I started off with 1/4 cup of sugar and slowly increased it to 3/8 cup to suit our tastes. Traditionally, shrikhand is much sweeter. 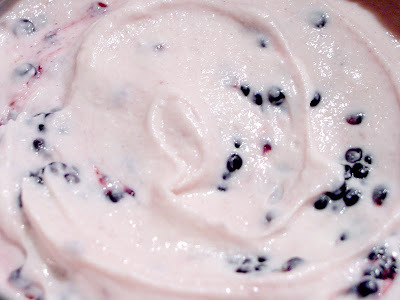 But remember that you don't want this berry shrikhand to be overly sweet such that the flavor of the berries is masked. Add the cardamom powder, if you are using it. I chose not to use it. Add the chopped berries and fold the berries into the fluffy shrikhand. 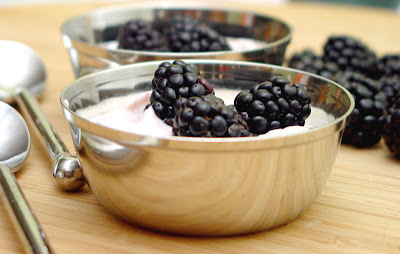 Every once in a while, press down lightly so that some of the blackberry juice is mixed into the shrikhand. Chill for at least a couple of hours, garnish with whole blackberries and serve as a dessert. Medha loved this berry shrikhand. Not so much my husband who found the berries 'overwhelming.' He likes his shrikhand made the traditional Gujarati way. Me? I love fruit shrikhand of all kinds! It's still May 9th here and I'm hoping to make it for Meeta's Monthly Mingle where Spring Is In The Air! Oh why, oh why...don't we get blueberries here! (sigh) They make the best muffins. But shrikhand looks beautiful! No cardamom is okay (what will Elaichi say, though!) but a pinch of nutmeg maybe? My family is a purist when it comes to Shrikhand - they don't care for amrakhand (never had with the blueberry, naturally). Hand mixed, always - not the smooth shiny puree in our home! And yes, saffron! And a pinch of salt too. Those geese have it good. These are not blueberries - I dream of blueberries! Lovely Shrikhand! and yes, Shrikhand with fruits is the only way i would have it. Great idea to use berries. I have tried it with mangoes and pineapple. You made it, you made it! Besides with that in your food basket I would NEVER turn you away from my door. Wow! Shrikand paired with Blackberries is a wonderfully unique way of enjoying this. Beautiful! Strawberries are coming soon... do they have "pick your own" farms outside of the city? I always thought I did not have a sweet tooth.After hanging around your blog, I am not sure. First, it was orange bread, then payasam and now this. It is not yet berry season here (there goes another look your way). I will definitely make it when they appear in the farmers market. I love those small khatoris you serve your desserts in. I have been looking for some serving dishes for desserts, but nothing has caught my fancy yet. Fruits in shrikhand is new for me. Will definitely try this one. I haven't made shrikhand in a while. No nutmeg for us, Anita. Glad you realized these were not blueberries. I hadn't eaten blueberries until I first visited the US either. I do love them, too! I buy dried blueberries and have them in my cereal or in pancakes as well as in salads. They contain some corn syrup so are not true dried fruit but I like them! Yay! Meeta, I was not sure I would be able to meet your deadline! There were too many things I was juggling so I am thrilled! Looking forward to another super round-up from you! No elaichi. And no cinnamon. My version is rather plain. Quite like the paal paayasam. But in simplicity can be found the most profound pleasures. So tsk! away all you want!! Most of the berries we get come from Mexico and the peak season seems to be April-May. There was a flood of raspberries last month and I see none now. And, of course, in the stores. Not much grows in Colorado when compared to other states and our berries come in late summer. I haven't seen berries grown in Colorado. It may just be that it was not the season or they were sold out the few times I made it to the Farmers Market last year. So berries from Mexico it has to be. So much for eating local, environment-friendly and sustainable! Nupur, it's very refreshing especially in the moody spring weather we experience. As for those allergies...sigh! Gini, try it out when you get nice fresh fruit. It's quite delicious. My husband brought me these stacking katoris in 3 sizes from India. These are the smallest and cutest. A friend of mine found equally cute stacking stainless steel bowls in Ross at 3 for $5, made in India. These were less than $20 for 40 in 3 sizes. He basically bought out whatever the little steel shop had! No cardamom. No nutmeg. No saffron. Skimmed milk. Blackberries (yes, that's right; black not blue). This is no Shrikhand - this is an Umreeki imposter fruit youghurt! poor D! And by the looks of it, you never make Shrikhand (orange, mango, ...what other fruit did she say?)! I like my desserts to be simple, you know? And why poor D? He's rich. He's got me! I sprinkled some elaichi on mine to see if I liked it. He chose not to! I preferred it without the elaichi though because I thought it tasted better with just the delicate flavor of blackberries. Well, at least you got the color of the berries and the berry right this time! Anita, notice how she's been talking a lot lately about the meditational quality of stirring... notice the great efficiency with which she conducts herself in the kitchen... and the simplicity, subtlety, and purity of flavours she is now so boldy adhering to... THE THIN SLICES OF KERELA!!!! I do believe she's being drawn in to a Japanese Zen Buddhist cult against her will!!! Quick! We have to save her! Manisha! Give up the moon-gazing and clear soups! Drive past the drive-through sushi bars! The four noble truths are three-and-a-half lies from a cereal box ingredient list! Come back to us! Quick Anita, where's the goda masala?!! That looks like a wonderful treat. Never tried any exotic Shrikhand flavors. Pleasing to the eye and the palatte. Have you ever used the Greek yogurt to make shrikhand? Nothing like homemade - bu t wonder if it is a viable shortcut? Shrikhand looks lovely with all those berries. I have never tasted Shrikhand but for blogs I would have never heard of them. Those berries make them really really good looking. Manisha I take the opposite stand on Indian sweets, love the ghee that oozes out. Occasionally it is ok to splurge with the fat. Okay, I admit, the berries do make it look bewitching :-) But we don't get any, other than the mulberry which, incidentally,is in season at the moment. But somehow, I don't think that is the right fruit for Shrikhand - it needs something with a hint of tartness, right? Aside: What is the deal with Americanese - past perfect tense of 'spell' is 'spelled', not spelt? And there is no word called 'learnt' either? It is there in British/Indian English, isn't it? Pel, I will not speak because what I have to say does not improve on the silence. GM, despite anything Anita has to say, this is really really good! I haven't used Greek yogurt. I am making copious amounts of yogurt each week to consume the milk that is delivered to my doorstep each weekend. I can skip delivery if I want but by the time I remember, the milk has already been delivered. So it will be a while before I try Greek yogurt. Why don't you try it and let me know?! Bee, thank you so much. Now if only some others could also appreciate the beauty of this dish! It is often said that as long as it looks good in a photo, who cares what it tastes like. I care. While it's nice to have pretty pictures, I care more about the taste and flavors! Pel, I have to break my silence to say: that's a freaking good one! But you forgot the link. The link back makes it a trackback! Reena, it's easy to confuse blackberries with mulberries because black mulberries look surprisingly like blackberries. Follow the links to Wikipedia and you wil notice that although they are from the same order (Rosales), they belong to different families. ISG, try it out and remember no matter what the Shrikhand Police may want you to think, fruit shrikhand does not have to be amrakhand (with mangoes). Currently mangoes are all anyone can think of but that happens every summer in India. :-D As for splurging with fat - ooh! I indulge! I do! I just don't like the taste of gobs of ghee. There is one mithai that my husband raves about - the name of which I am blanking on - it has huge pockets of just ghee. 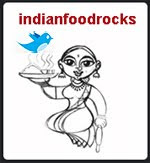 You may notice that the Indian desserts I love are mainly milk based like rasgulla, ras malai, paal paayasam and why! Fruit shrikhand, too! Anita, you know this is called giving with one hand and taking away with the other. :-D Blackberries have a wonderful sweet and tart flavor. The blueberry, on the other hand, is considered to be a poor cousin in taste to the blackberry. You have to get good quality blackberries to enjoy them - overripe is no good. This particular batch was very delicious. Blackberries are tart and when ripe, they are also sweet. I am beginning to think that you haven't had good quality blackberries! No 't' in past participle here. Spell, spelled, spelled. Learn, learned, learned. I once got an email telling me that spelt was a type of wheat and the word really should be spelled. Five years ago I was told that you cannot club things together - although I've seen a professor of English use it in the same manner recently but then he's of Indian origin. Club in the US means to beat with a stick. Luckily the person I was writing to was in Belgium and he was familiar with the usage. But my American colleagues were horrified. Another one that gets me is run, ran, ran instead of run, ran, run. "I have ran all the reports." And I have seen that from a teacher of English. Speaking of teachers, I regularly get flyers from Medha's school with a schedule for the evening: 6:30pm begins the PTA meeting. Kay sangtes, Richa! Not even aamrakhand? Amul makes aamrakhand and I think you should be able to get it at your local Indian grocer. Better still, make it yourself. It will be plain and absolutely traditional though, and if the crowd is lucky there will be pooris too. I would send you some but they don't travel well. That's such a yummy looking shrikhand. I have eaten mango and strawberry shrikhand, but never tasted blueberry one. The goose with the babies looks cute. And the shop u mentioned, I have never been thr, but I will surely drop in when I go to India. ET, you go girl! I hope they appreciate your efforts! Puris - now that is the kind of splurge on fat that I like to indulge in. :-D Please take pictures! And say hello to some of those rowdies from me. Swapna, thanks! This is with blackberries though, not blueberries. You're from Bombay, too? Yay! aga, everyone in the family enjoys amrakhand, but, are you ready for this, i don't eat mangoes, will tell you the story sometime, nivant basoon ;-) it's a long one!! ani yes, wadiyan baddal, jara time lagel baraka! You won't be the first one. My husband is not crazy about mangoes either. But he is of a different species altogether. :-D IA friend of mine wouldn't go anywhere near mangoes as she grew up with a mango tree in her backyard and the smell of rotting mangoes turned her off this wonderful fruit forever. I hope your story isn't like this. But yeah! let's hear it soon! Photography tip to avoid fat reflections in your spoons, katoris and thalis: use a tripod or keep the camera on a pile of books or at some strategic place and use the timer! Do remember to move away from scene though! Swapna, way cool! One other difference: our Louisville is said Lewisville. thanks for the tip, will keep that in mind when i'm around steel next time. nahi ga, i do not have wadiyan recipe, i've noticed that even back home, people have started buying from their trusted rationwala rather than spend all that time, not to mention the hard work involved. but i'm sure some do still make it & have to just find that out. The last time I went was 3 years ago- just my mom and I. It takes a lot of picking to make a quart... I never told my mother that I decided to make my share into jam, which I left unattended for too long and burned it into charcoal... Those were truly black, but the berries themselves are a deep, deep magenta, and like Manisha says they have an extraordinary flavour! They could be dried... raspberries (very close relative) are! Looks like I will have to attempt to deconstruct the wadi. Or just wait for more benevolent souls to send more my way. Hint! Hint! Sunita, the weekend's upon us. What are you waiting for? Enjoy the desserts and step outside and enjoy the wonderful season! Ouch, Pel! That must have been difficult! Blackberries grow wild by the roadside, too! But those shouldn't be eaten because of the toxic build-up from gas fumes or so I either read or heard. Piegirl, look for the Wallaby brand. I get it at Wild Oats as well as Whole Foods. This is creamy and not custardy or gelatinous and its flavor is most like homemade yogurt. As for muslin, a large man's cotton handkerchief also works wonders. Let me know how it goes! If only we all had large men around to borrow hankerchiefs from! LOL! Seriously! The two of you waltzed straight into that one and I love it! It isn't necessarily on my blog. It might be. Then again, it might not be. I love Shrikhand and I should try this recipe for sure. I too kind of like mango Shrikand ,we have grown over Amul's Shrikand ,but sure will try this out in home ..
Wow! Black Berry Shrikand! A wonderful recipe. The step by step guidance accompanied by the pictures makes this recipe an excellent one. Most of us have had the traditional Gujarati one and this one with the black berries is a refreshing change. It is great step by step pictures. Shrikhand with berry that is delicious. Thank you all for your wonderful comments and feedback! Happy Cook, welcome to IFR! Looks lovely, quite exotic, I would love to try this recipe. I have tagged you. Please refer to my blog http://sukanya-keralaiyer.blogspot.com/ for further details. Makes me droll. Yum, yum, yum.